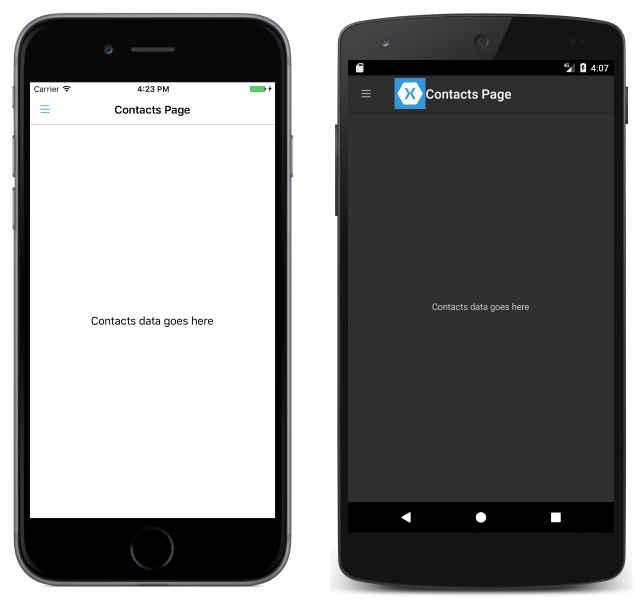 The Xamarin.Forms MasterDetailPage is a page that manages two related pages of information – a master page that presents items, and a detail page that presents details about items on the master page. This article explains how to use a MasterDetailPage and navigate between its pages of information. On iOS, the navigation bar is present at the top of the page and has a button that navigates to the detail page. In addition, the active detail page can be navigated to by swiping the master page to the left. On Android, the navigation bar is present at the top of the page and displays a title, an icon, and a button that navigates to the detail page. The icon is defined in the [Activity] attribute that decorates the MainActivity class in the Android platform-specific project. In addition, the active detail page can be navigated to by swiping the master page to the left, by tapping the detail page at the far right of the screen, and by tapping the Back button at the bottom of the screen. On the Universal Windows Platform (UWP), the navigation bar is present at the top of the page and has a button that navigates to the detail page. On iOS, the navigation bar is present at the top of the page and displays a title, and has a button that returns to the master page, provided that the detail page instance is wrapped in the NavigationPage instance. In addition, the master page can be returned to by swiping the detail page to the right. On Android, a navigation bar is present at the top of the page and displays a title, an icon, and a button that returns to the master page. The icon is defined in the [Activity] attribute that decorates the MainActivity class in the Android platform-specific project. On UWP, the navigation bar is present at the top of the page and displays a title, and has a button that returns to the master page. On iOS, the detail page slides to the right as the master page slides from the left, and the left part of the detail page is still visible. On Android, the detail and master pages are overlaid on each other. On UWP, the master page slides from the left over part of the detail page, provided that the MasterBehavior property is set to Popover. For more information, see Controlling the Detail Page Display Behavior. Similar behavior will be observed in landscape mode, except that the master page on iOS and Android has a similar width as the master page in portrait mode, so more of the detail page will be visible. For information about controlling the navigation behavior, see Controlling the Detail Page Display Behavior. A MasterDetailPage contains Master and Detail properties that are both of type Page, which are used to get and set the master and detail pages respectively. A MasterDetailPage is designed to be a root page, and using it as a child page in other page types could result in unexpected and inconsistent behavior. In addition, it's recommended that the master page of a MasterDetailPage should always be a ContentPage instance, and that the detail page should only be populated with TabbedPage, NavigationPage, and ContentPage instances. This will help to ensure a consistent user experience across all platforms. The MasterDetailPage.Master property is set to a ContentPage instance. The MasterDetailPage.Detail property is set to a NavigationPage containing a ContentPage instance. The page consists of a ListView that's populated with data in XAML by setting its ItemsSource property to an array of MasterPageItem instances. Each MasterPageItem defines Title, IconSource, and TargetType properties. A DataTemplate is assigned to the ListView.ItemTemplate property, to display each MasterPageItem. The DataTemplate contains a ViewCell that consists of an Image and a Label. The Image displays the IconSource property value, and the Label displays the Title property value, for each MasterPageItem. The page has its Title and Icon properties set. The icon will appear on the detail page, provided that the detail page has a title bar. This must be enabled on iOS by wrapping the detail page instance in a NavigationPage instance. The MasterDetailPage.Master page must have its Title property set, or an exception will occur. It retrieves the SelectedItem from the ListView instance, and provided that it's not null, sets the detail page to a new instance of the page type stored in the TargetType property of the MasterPageItem. 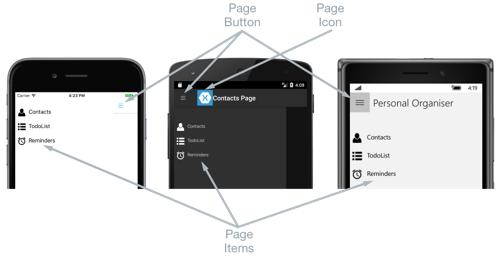 The page type is wrapped in a NavigationPage instance to ensure that the icon referenced through the Icon property on the MasterPage is shown on the detail page in iOS. The selected item in the ListView is set to null to ensure that none of the ListView items will be selected next time the MasterPage is presented. The detail page is presented to the user by setting the MasterDetailPage.IsPresented property to false. This property controls whether the master or detail page is presented. It should be set to true to display the master page, and to false to display the detail page. Default – The pages are displayed using the platform default. Popover – The detail page covers, or partially covers the master page. Split – The master page is displayed on the left and the detail page is on the right. SplitOnLandscape – A split screen is used when the device is in landscape orientation. SplitOnPortrait – A split screen is used when the device is in portrait orientation. However, the value of the MasterBehavior property only affects applications running on tablets or the desktop. Applications running on phones always have the Popover behavior. This article demonstrated how to use a MasterDetailPage and navigate between its pages of information. 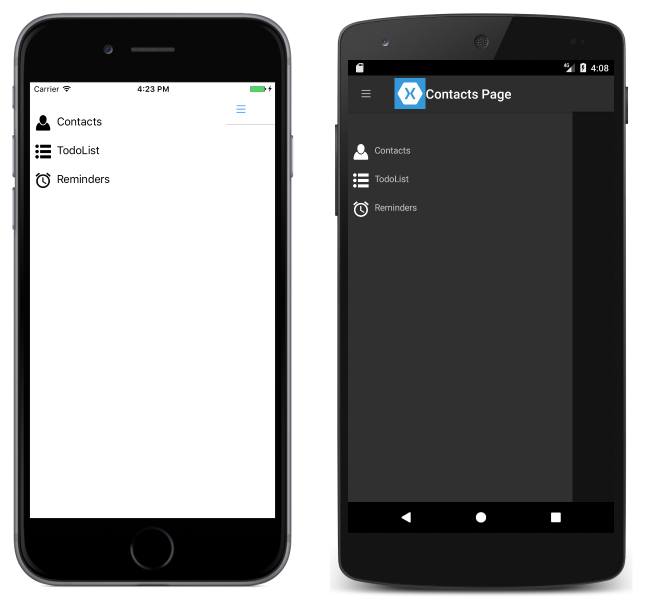 The Xamarin.Forms MasterDetailPage is a page that manages two pages of related information – a master page that presents items, and a detail page that presents details about items on the master page.